NORMAN, Okla., Sporting Alert — Trae Young scored 18 of his 26 points in the second half and No. 12 Oklahoma defeated No. 5 Kansas 85-80 in Big 12 action on Tuesday night. Remarkably, Young took just nine shots and made seven of them to go along with nine assists, four rebounds and two steals. Christian James added 15 points and Brady Manek ended with 14 points and seven rebounds for the Sooners (15-4, 5-3 Big 12), who shot 52 percent in the second half to hand Kansas its second conference loss this season. Svi Mykhailiuk had 24 points, five rebounds and four assists for Kansas, while Malik Newman scored 15 of his 20 points in the first half. Devonte’ Graham had 11 points, nine assists and seven rebounds for the Jayhawks (16-4, 6-2) in the defeat. 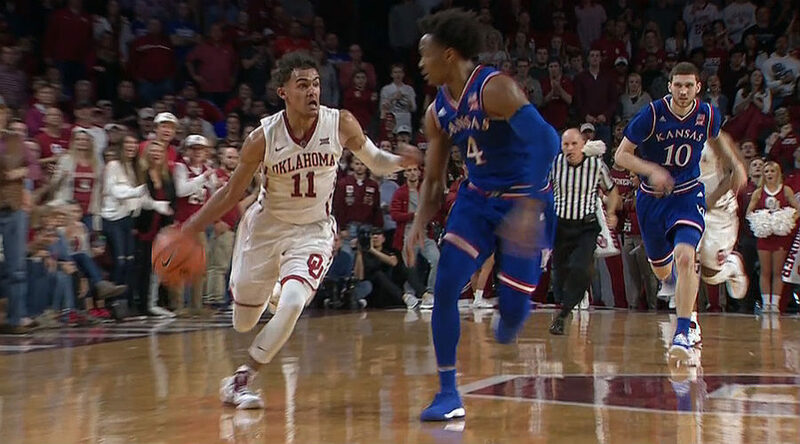 The Sooners held a 10 point advantage with 3:26 left in the first half, but Kansas clawed back to cut the deficit to just two points after going into the halftime break trailing 43-41. Kansas then used a 17-6 run to start the second half and opened up a 58-49 lead for the visitors. Oklahoma trailed for most of the second half and fell behind by as many as 10 points in the second half. However, Young, who found his teammates twice for the go-head and decisive 3-pointers in the final minute of the game, helped the Sooners rallied late to finish with an 8-0 run to secure their fourth win against Top 10 teams this season. Young, after taking some heavy criticism in the past few days, trusted his teammates much more tonight, and especially at crunch time, and they delivered. Young had seven of his total assists in the first half and he admits it helped everyone. It was a vital win for Oklahoma tonight after the Sooners suffered back-to-back losses to unranked opponents, Kansas State and Oklahoma State last week. As a team, Kansas shot 45 percent from the floor, but was 31 percent from 3-point range. Following their impressive second half showing, the Sooners finished 49 percent from the floor and were 39 percent from 3-point range. Kansas will play host to Texas A&M on Saturday in the Big 12 and SEC Challenge. Oklahoma hits the road to take on Alabama on Saturday in the Big 12 and SEC Challenge.